When we finalized the plans to join other Church of God leaders on a “vision” trip to visit Mike and Heather Webb last year, I was excited. But I was also completely unaware of how transformational the trip could be. Though my wife and I had traveled internationally, we had never been on the African continent. We were very much in over our heads. The trip began quickly as we landed at Kilimanjaro on a warm evening. The stark differences between a major U.S. or European airport were immediate. Before we could get our bearings, we were on the road, unaware of the wonders that lay ahead beyond the dark veil of the roadside. Photo: Kyle spends time in prayer with locals. The first morning was a microcosm of the beauty that would be our entire trip. The warmth of the mountains, the people, and the mystery of Tanzania were infectious. While drowning in the newness of our surroundings, we couldn’t help but notice elements that were all too familiar. Our team was composed of all mission leaders, so the conversations and laughter just flowed freely. The SUVs acted as our greatest conference rooms! We talked about life, missiology, and Africa. I was so thankful for the honest way in which the Webbs told us the stories of the continent. We discussed history, successes, and challenges, all with an openness and willingness to learn and grow. My wife and I left those conversations understanding the immensity and importance of a new vision for the African Church of God movement, and an eagerness for our faith community to play a serious role in that effort. 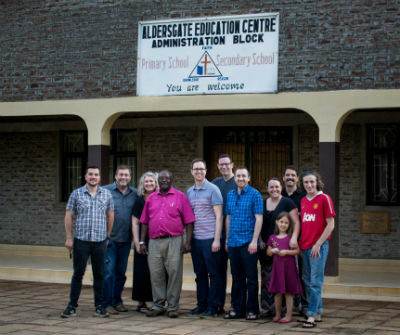 Photo: Kyle (far left) and the vision trip team at Aldersgate. Overall, I believe vision trips like this are of great importance for healthy missions and partnership. Oftentimes, missions teams are so caught up in doing that they are unable to learn anything from the indigenous leaders and the locals. The momentum and collaboration that we observed was palpable and obvious to the watching eye. We want to thank the Webbs, Global Strategy, and our fellow travelers for making this such a momentous trip for our family, as well as the ways it will positively affect the missions program at Salem Church of God. Kyle Hayes is the outreach pastor at Salem Church of God in Clayton, Ohio. Learn more and offer your support to the Webbs and Global Strategy at www.chogglobal.org. 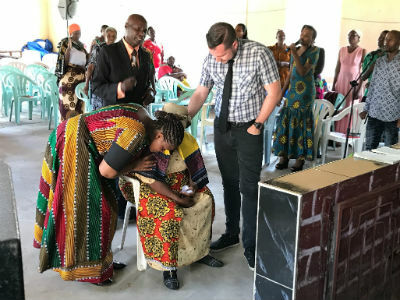 This entry was posted in All Church of God, Global Strategy and tagged Africa, Clayton, cross-cultural, Dayton, Global Strategy, international, Kyle Hayes, Mike and Heather Webb, mission trip, missions, Ohio, Salem Church of God, Tanzania, vision trip, Webbs. Bookmark the permalink.